Raffe Simonian. Age 85 of Park Ridge. 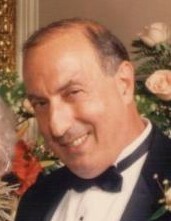 Beloved husband of the late Ferryl, nee Fisher. Loving father of Leslie, Lara (Mark Beougher) and the late Kira Simonian. Dear grandfather of Vincent Simonian, Jordyn and Shannon Pietroske. Dearest great-grandfather of Arya and Callisto. Brother of Judith (John) Wittmus. Visitation Tuesday, May 8, 3-8 p.m. at Ryan-Parke Funeral Home, 120 S. Northwest Hwy. (2 blks. S. of Touhy), Park Ridge. Funeral Wednesday, family and friends to meet for a 10 a.m. service at St. Gregory the Illuminator Armenian Church, 6700 W. Diversey Ave., Chicago, IL 60707. Interment private. Memorials to St. Gregory the Illuminator Armenian Church are appreciated.